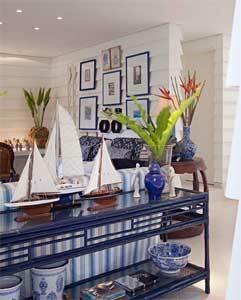 Nautical Decor Ideas : I love a nautical, Coastal Living themed room. Navy blue and white color scheme, boating and nautical home decor, cool wall art, and lots of seashells and lanterns create the scene. The beach is where my heart is, so I feel right at home in the nautical setting. Nautical decor always been associated with elegance and good taste. A reproduction of a frigate in a law firm, a marine picture in the living room, an anchor-shaped lamp in the room. The nautical decor means no fishing, but is more associated with pleasure boating, sailing style. This traditional entry design is so light and airy. 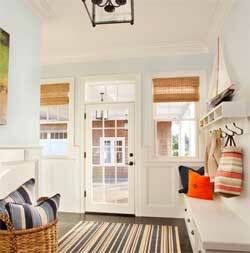 I love the nautical striped rug and pillows and the boat on the shelf. This contemporary living room design has clean and fresh white walls with more boats on display as well. The classic blue and white china always is in style. More boats and nautical decorating ideas in this living room and sunny porch below. There are places in Europe to great nautical tradition , and home decor is based exclusively on marine motifs . I'm on the example of Brittany, specifically the area of Sait melo and Cancale , without forgetting the Mont Saitn Michiel . In any home or restaurant in this area of France have nautical motifs on the door , two, three or more model ships and sailboats in the house , curtains decorated boats, knots and nautical paintings , stuffed animals like starfish , crabs , lobsters , shells of all kinds. It is a pleasure to come and be for a couple of weeks in this nautical setting and sailor. Home decorating is a pleasure living in a pleasant and comfortable environment surrounded by natural elements , water and marine . We have many more products than those offered in the store, as all kinds of tablecloths , napkins , coasters , dinnerware nautical and marine books rests , open bottles, etc. .
Is decorating your restaurant? How can get unique nautical decor products ? At the workshop we have all kinds of decorative items as and tastes of our customers . Have a business or office ? As more cache can give to your office? The nautical items are always considered as elements of elegance and good taste. A good frigate or galleon on a shelf help create that environment.